Great field of cars on hand for our first fan club night at the speedway. MOM Nature tried but just could stop Ralph Warning a crew from giving all the fans a night of racing. 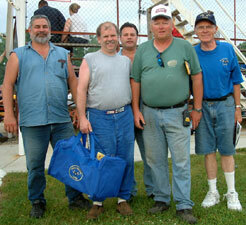 Our MARFC/Uniform Helmet Bag was presented to a veteran of 25 years of the speedway Alan Reaume. Alan has run in just about every division there is at Galesburg. Thanks again to Ralph and his staffs for having us come into their great racing facility. Special thanks to Board member Jeff Moroni along with Doug Jakeway & Denny Trinklen for helping out at our MARFC table. Next post More Fan Club Days! !